The cherry blossoms on campus were in full bloom just in time for this year’s Japan Week festivities. This year’s celebration featured six events that included calligraphy, kimonos, tea, taiko drumming and more. The first event was held on Friday, March 29 in Wyatt Hall, where University of Puget Sound students were provided a space to practice their calligraphy skills while sipping on Japanese-inspired drinks. On Monday, April 1, also in Wyatt, University of Puget Sound senior Hannah Kayama and her mother Mariko Kayama assisted in organizing a kimono demonstration. Mariko Kayama owns and runs her own kimono shop in Kirkland, Washington, though many of the kimonos came from her mother’s company in Japan. The demonstration featured a variety of male hakamas as well as coming of age and wedding kimonos. Afterwards, a photoshoot was held for any students who wished to try on a kimono, which on average costs upwards of $3,000. On Tuesday, April 2, Mikiko Ludden, a University of Puget Sound Asian Languages and Cultures professor and the main organizer of Japan Week, held a tea-tasting event in Wyatt. Ludden provided cups and tea pots for students to try five different kinds of tea. She also offered various Japanese sweets in order to offset the bitterness of the teas. “It’s a great event because Mikiko is a Japan native so we’re lucky to have her explain all of this,” Jan Leuchtenberger, the director of the University of Puget Sound Asian Studies program, said. The tasting involved a classic green tea, a black soybean tea that helps with digestion, a tea only made in Tokushima, Japan, a roasted green tea and a pricey tea that usually goes for around $80 per 100 grams. 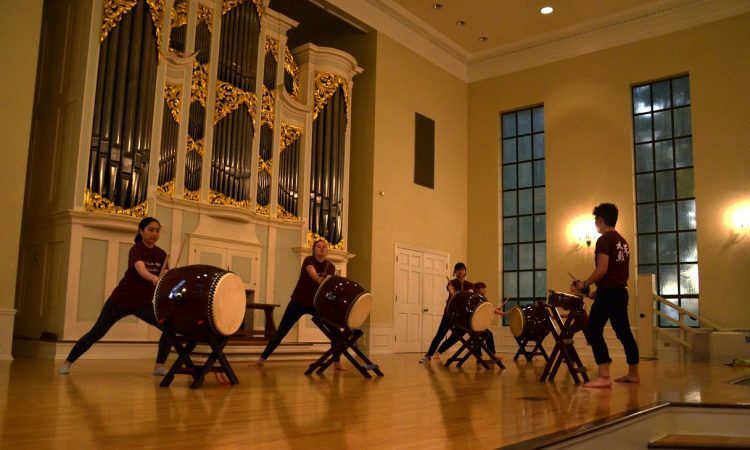 The festivities of the week ramped up on Wednesday with a performance featuring the tsugaru-shamisen and taiko drums in Kilworth Chapel. To start the night, Patrick Oiye, a Seattle native now living in Tacoma, played four songs on the tsugaru-shamisen, a Japanese instrument with three strings that strongly resembles a banjo. Before playing his pieces, Oiye introduced the tsugaru-shamisen and told the audience a little bit about the three types of tsugaru-shamisens, the different tunings and the signature ‘twang’ that the instrument makes when played. Following Oiye, the University of Puget Sound’s Taiko Club, led by University of Puget Sound senior Nicholas Navin, performed two songs. “The first song that we played is called ‘Matsuri,’ which means ‘festival,’” he said. “The version that we played was modified by our president who graduated last year,” he explained. The second song performed was called “Liszt,” which they pronounce as “listo” though it is based off of Hungarian composer Franz Liszt. “Apparently it has to do with Franz Liszt liking very complicated rhythms, something to do with complicatedness,” Navin said. On Thursday, the Japan House, located at 1128 N. Lawrence St., hosted a cookie decorating session. The Japan Week festivities ended on Friday, April 5 in Wyatt with a mochi-making session, where a traditional mochi pounding was demonstrated. Japan Week is an annual event, and activities are open to the public, so be on the lookout next year for event listings on the University of Puget Sound Events Calendar. Or, if you’d like to be more involved in Japan Week, taiko club is open to students with no experience necessary, so contact Nicholas Navin to join.